Cabasse launches stylish Alcyone 2 cinema system | What Hi-Fi? Cabasse has launched the second generation of its stylish Alcyone home cinema system, unsurprisingly named, the Alcyone 2. Compact and easy on the eye, the Alcyone 2 satellite speakers use a magnetic fixing system to make it easy to use the speakers on a wall, bookshelf or the proprietary stands (optional extras). Inside the 99mm-diameter spherical speaker is a new "cellulose fibre membrane" driver, which aims to extend the high and low frequency response. The new Cabasse satellites are joined by a 30cm cube subwoofer, which weighs in at 10kg and delivers 100 watts of power. Introducing the new products, Christophe Cabasse said: "Replacing a product as successful as the original Alcyone is never an easy thing to do, but our engineers have excelled themselves in making this product even better than the first. "Its ability to integrate so well, both acoustically and aesthetically, is testament to the work done by the team to bring the essence of Cabasse and the quality we stand for to the entry level home cinema market." Both the satellites and sub are available in gloss black or white. 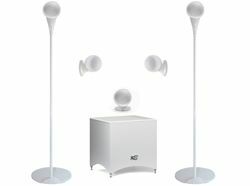 The Cabasse Alcyone 2 5.1 system is £599 or a single Alcyone 2 satellite speaker is £129. Finally, a pair of Alcyone 2 stands is £229.